Late last month graffiti vandals defaced the historic Kapena Falls. 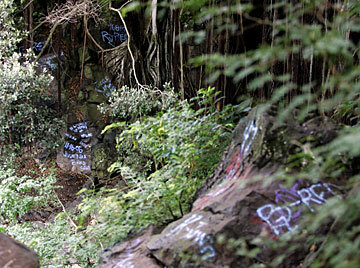 Baby-blue spray paint was scrawled over a dozen boulders and rock faces on both sides of Nuuanu Stream. A can of spray paint tossed in the roots of a banyan tree near the Pali Highway gives a hint of what lies ahead down the muddy hiking trail. Late last month, graffiti vandals burst past their typical urban canvas to deface historic Kapena Falls, a natural oasis hidden by a 30-foot veil of dangling banyan roots. Baby-blue spray paint is scrawled over a dozen boulders and rock faces on both sides of Nuuanu Stream. "To spray a wall is one thing -- these guys sprayed a waterfall," said Nessa Vierra, head of Friends of Kapena Falls, shaking her hands in disgust. "I don't know if they realize what they're doing is destroying something that's so precious to so many people." Vierra grew up playing at the falls, where generations of youngsters have plunged from a 37-foot cliff into the deep pool. She now leads the volunteer group that has been restoring the tranquil spot, where bird song drifts down from the tree canopy to meet the rushing sound of the stream. The Nuuanu resident was galvanized into action three years ago when the state approved plans to push a stripped-down Jeep over the falls for a movie stunt. Since then, she and other volunteers have been working to restore native vegetation, pick up litter and forge a trail along the stream that is safe for children and seniors. Now Friends of Kapena Falls and the state Department of Land and Natural Resources, which manages the site, face a new challenge: removing extensive graffiti without solvents that could cause more damage to the rocks and stream. 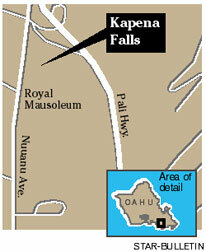 To volunteer to help maintain Kapena Falls or to make a donation, contact the Friends of Kapena Falls at 738-8228. The urban scrawl dismayed a group of tourists who trekked to the falls on Wednesday. "It takes away from the beautiful scenery," said Kara Shelby, a first-time Hawaii visitor from Flint, Mich., clutching a camera. "I wish the people who did it were caught." Her tour guide, Kainoa Dela Cruz, of Oahu Nature Tours, said "I feel shame" to see his neighborhood's name -- Kalihi -- among the words scrawled at the site. "We'd like to help with the clean up in any way we can," he said. Visitors have left their mark before at Kapena, but on a small scale, scraping their names or initials on a few rocks. But this time, graffiti is scrawled all over. The crude lettering includes the words "Kalihi" and "K-town," "G-Red" and "B-Red," and perhaps aptly, "Juvenile." Unlike graffiti on buildings, which can be wiped out with fresh paint on a roller brush, the rock surfaces will require hours of scrubbing with a wire brush. Some are hard to reach, partway down the cliff. But Vierra promised to get right on the job. "I'm hoping my pohaku (rocks) going spit out the paint," she said. "If you're going to write on the rocks," she added, "please use chalk or water soluble paint. Have a heart." Kapena Falls is a historic site, with ancient Hawaiian petroglyphs and rock bowls where awapuhi ginger was once pounded into soap. The pool at the base of the falls is one of Nuuanu Stream's biggest, although lately the danger of contracting leptospirosis has dampened its popularity. Ed Underwood, Oahu parks district superintendent for the Department of Land and Natural Resources, said the state depends on Vierra and her volunteers to maintain the site. About 15 people turn out for Friends of Kapena Falls work days, scheduled once a month. "We appreciate her help 100 percent," he said. "Unfortunately, now all of her volunteer time to make the place better is now being wasted on trying to clean up someone's mess."